Fig. 2. 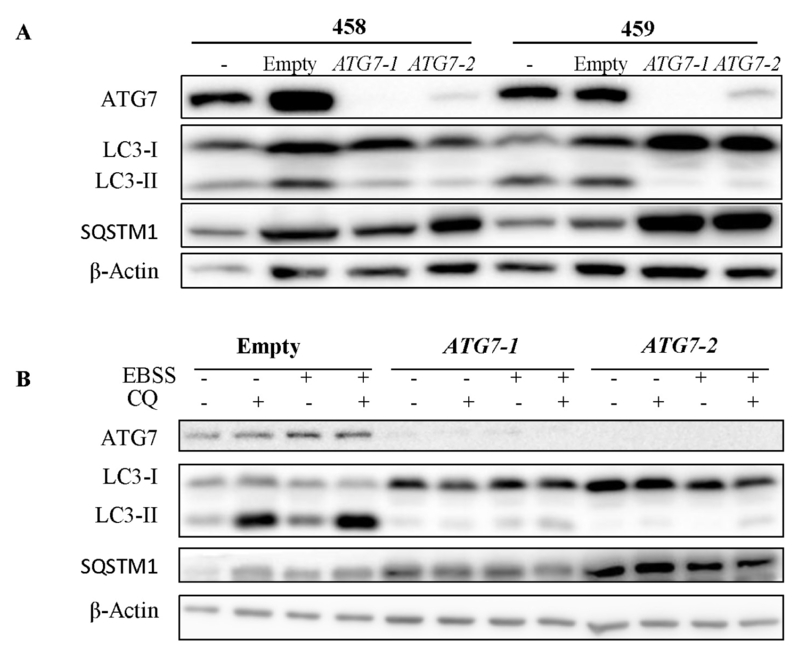 The effect of knocking out ATG7 on autophagy. (A) The effect of knocking out ATG7 on basal level of autophagy in the two Cas9 systems. (B) The effect of starvation and/or CQ treatment on autophagic flux in ATG7 knockout cells in PX458 systems. Immunoblotting of ATG7, LC3 and SQSTM1 using lysates from HEK293FT cells transfected with respective vectors inserted with two target sites, either ATG7-1 or ATG7-2. β-ACTIN served as a loading control. Cells were subjected to EBSS starvation and/or 50 μM of CQ treatment for two hours.